It’s already mid-March. Remember how I wrote about participating in the Make Nine -challenge this year? Well, it’s about time I do something about it, right? Ok, I did make a hat, but that was like the easiest task of the bunch. So here comes the second piece! A dress. 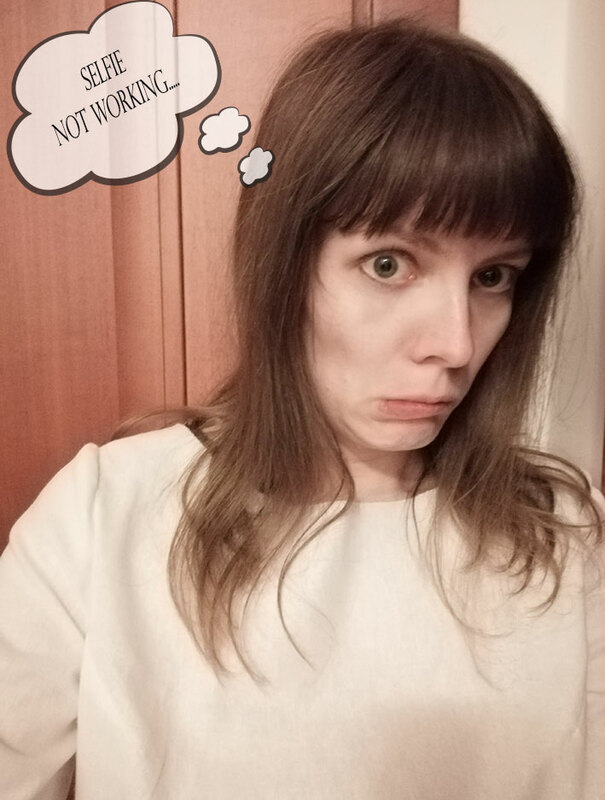 And like I promised, I’m going to show you the process, concentrating especially on the pattern making -part of it, modifying the basic bodice pattern. 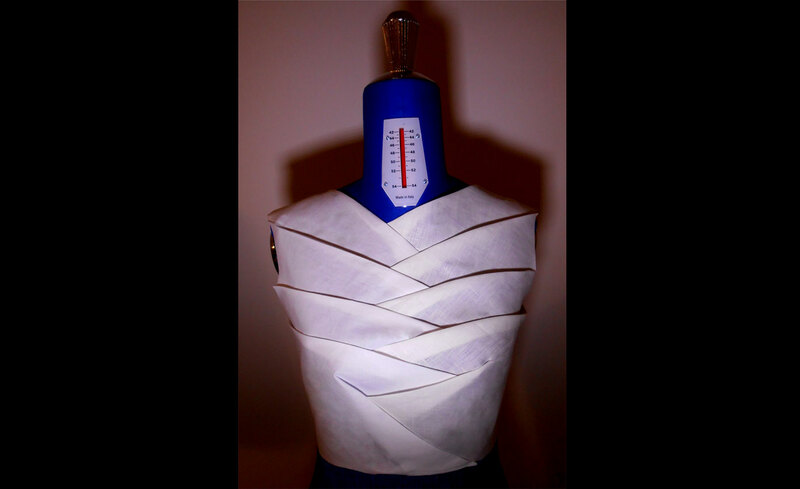 Basically you’ll see how to copy a dress to your own measurements, having just a picture of it. Maybe making some slight changes to the shape. If you like the style of this dress, you can follow the instructions and make your own! So this is the dress in question. 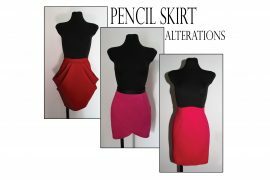 The first thing I do, is analyze different parts of the garment. You can see some of my considerations in the picture. Which basic pattern should I use as the base? 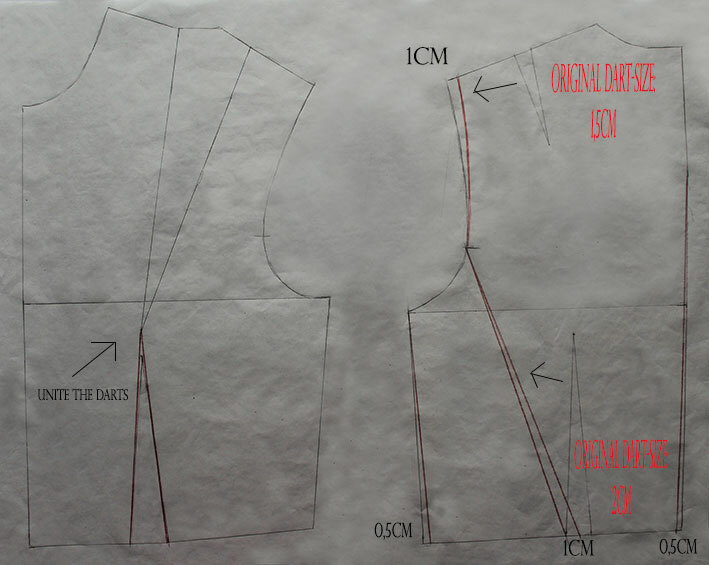 In this case the bodice is quite fitted and there is a dart (could be a side panel, too) so naturally I will go for the basic bodice pattern with the darts. Complete with the sleeves of course. Personally I have a few different ones, with more or less ease. I’m going with the one with less ease here. 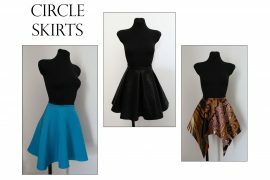 The skirt is flared and ends above the knees. It seems to even have two pleats in the front, but I’m going to ignore them. 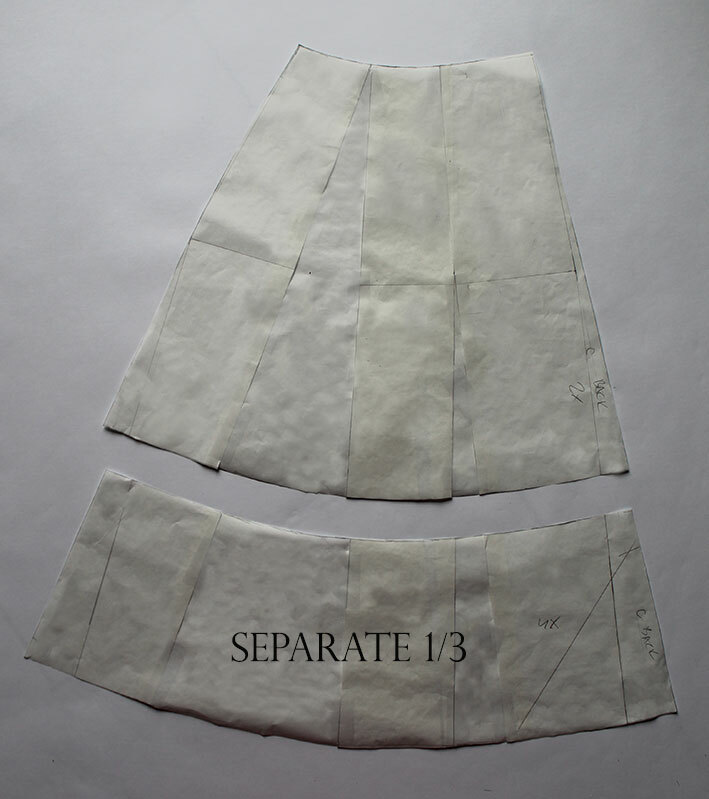 There’s a bias cut section, that is wide about 1/3 of the total length of the skirt. The sleeves are really basic long sleeves. No visible puff at the sleeve cap. There’s some extra space around the wrist area, so I’m going to make it wider than the basic sleeve at that point. You can’t see the backside of the dress here. In some cases you have a picture of the back as well, but I don’t think you really need it. You can just invent it! I’m going to go for the most simple back design: no darts, just a zipper in the middle. This is the pattern you’re going to use to make the toile. 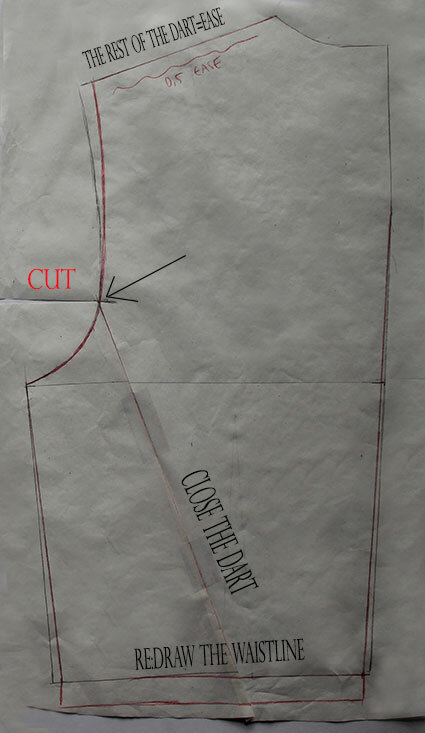 I know some of you might make the final dress directly, maybe with larger seam allowance and adjust it on the go. But I prefer to always make a toile first. 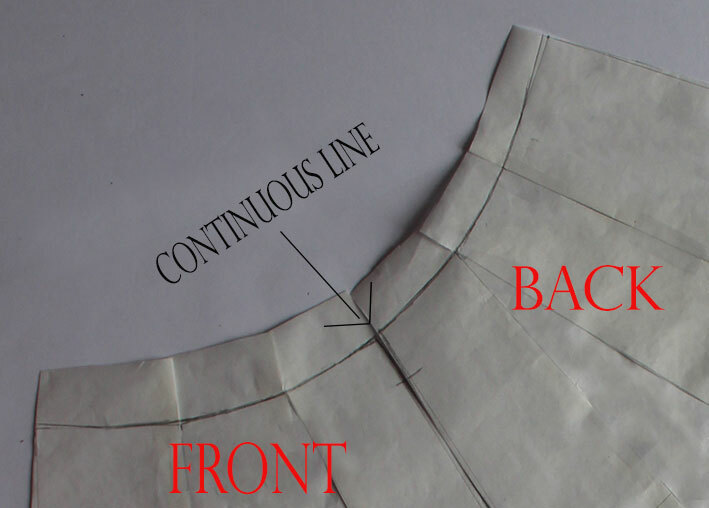 So this is the starting point: the basic bodice pattern. When using one made with your own measurements, you’ll automatically end up with a dress that fits you perfectly. I copied mine from the waistline up. Yours should look somewhat similar, except for the measurements. Let’s start to modify the pattern then! First you can check how much ease you have and if you need to take something off, do that by making the darts wider and/or taking in the side seams and/or back seam. Then it’s time to concentrate on the darts. When it comes to the back piece, I wanted to get rid of the darts completely. There are two darts. 2/3 of the shoulder dart will come off at the shoulder tip. Then you just re-drew the armscye. The rest will remain as ease. 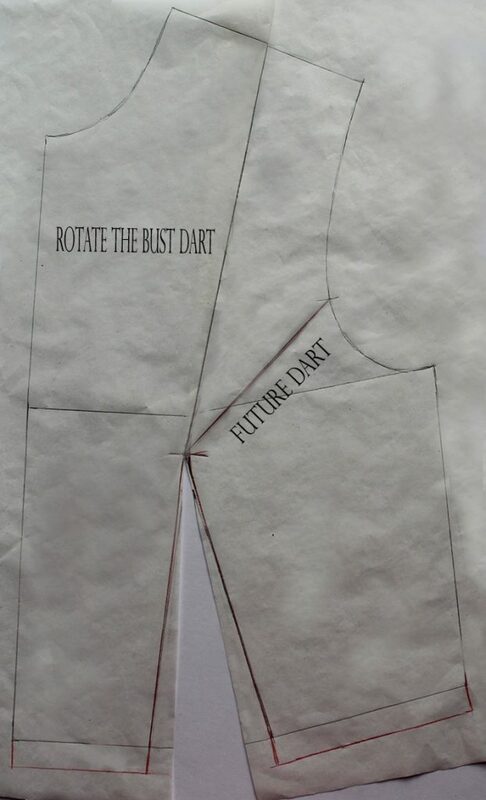 The waist dart is divided, as you can see in the drawing: 0,5cm or 0,2in comes off at the side seam, 0,5cm or 0,2in at the centre back and the rest becomes a new dart that ends at the armscye. This will then be closed and the dart will be gone, as you’ll see in the next picture. At the front, we’ll just unite the two darts for now. In the front, I closed the bust dart so that both darts are now at the waist. The new dart is already drawn, but I didn’t open it yet, because this way I could work better on the shoulder line and the armscye. How about the neckline? Here’s a little trick for you! This works especially with the boat/bateau neckline. Mine isn’t that wide, but I used it anyways. Draw the front neckline first. I left 6cm or 2,36in shoulder line. 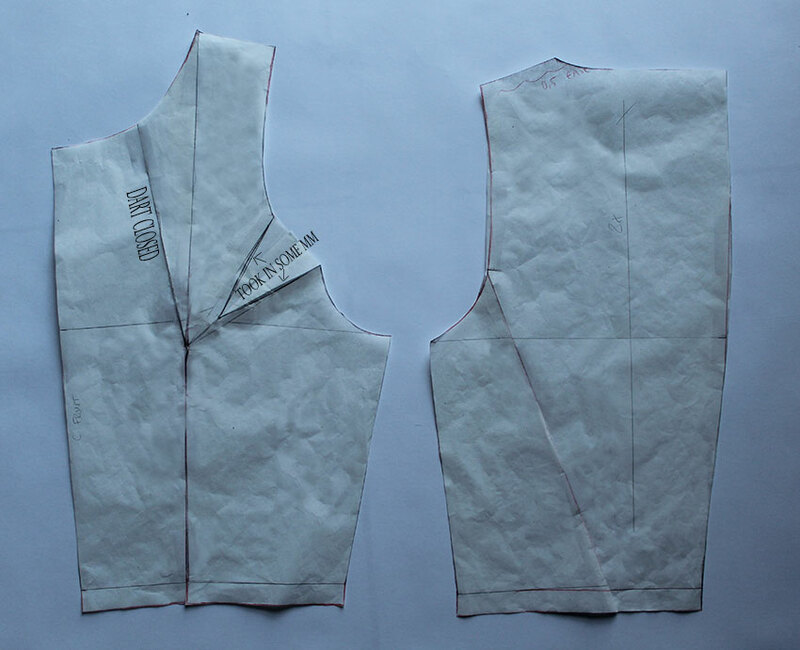 Then draw the back, measuring the same amount starting from the shoulder tip. This is what will happen: remember that 0,5cm ease we left to the back shoulder? 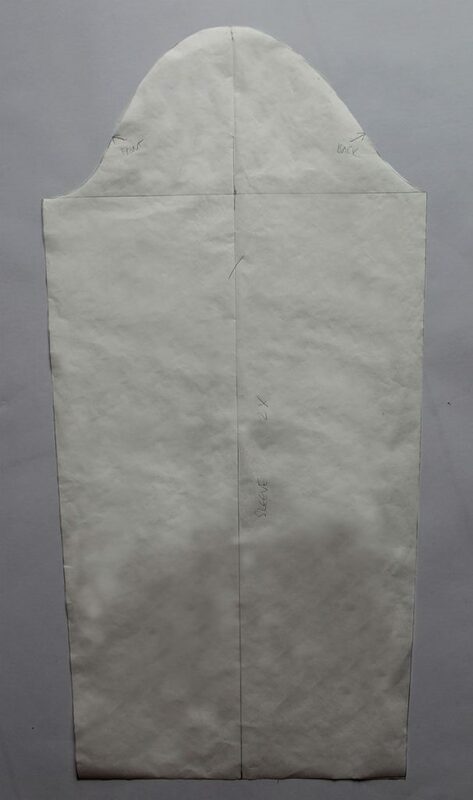 Here in the picture you can see, that the back piece is now 0,5cm wider and will keep pulling the front piece towards the sides when the garment is worn. This will make the neckline gape less. Check that the neckline and the armscye line are flowing nicely between the two pieces by placing the shoulder lines together. While you’re at it, do the same with the other end of the armscye line. This is why I didn’t open the new dart yet. It would’ve been in the way. Lastly I checked the waistline in the same way, and cut the pieces. Then finally I rotated the dart. 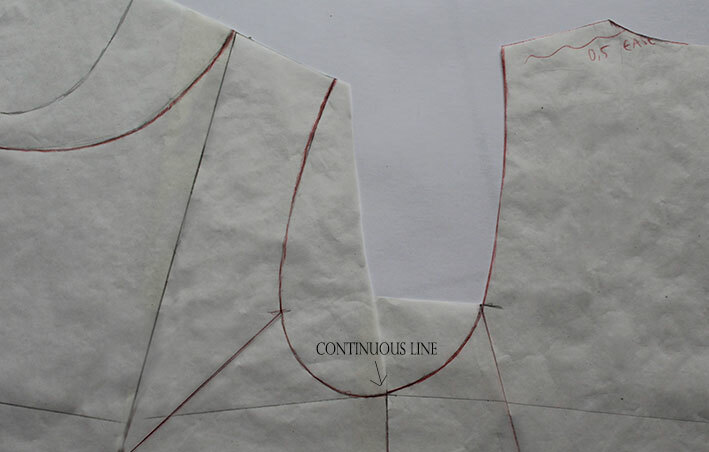 As the basic bodice pattern already comes with the sleeves, this passage was easy. All I did was make it a bit wider at wrist. The only part missing from the pattern now is the skirt. 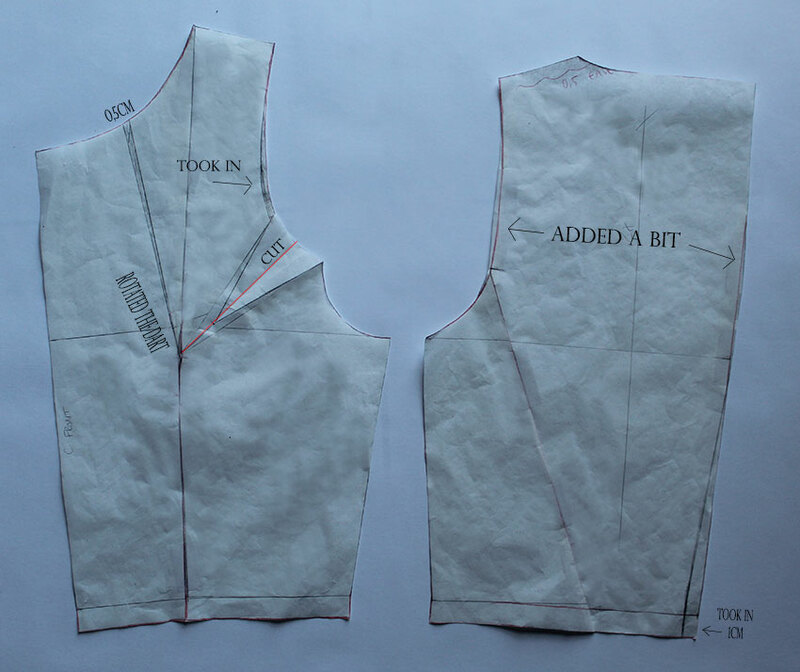 I copied the remaining bit of my basic bodice pattern, that is, from waist to hip, with darts included. I had measured 52cm or 20,47in as a perfect skirt length, so I lengthened the pattern accordingly. To make it turn into a flared skirt, I used the same method I explained last time: using the dart-volume, the slash and spread -method and adding extra volume to the sides and centre front & -back. 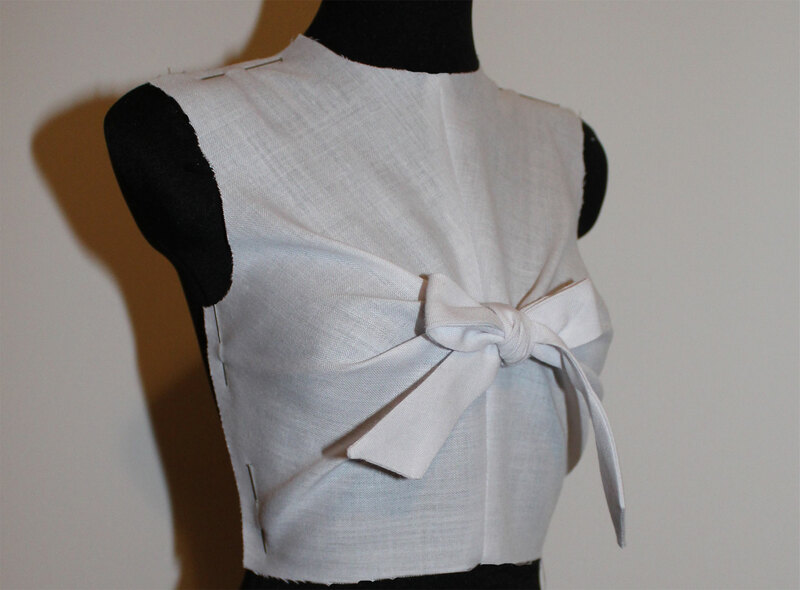 Then I placed the front and back pieces together to draw a continuous line both at the waist and the hemline. And checked that the skirt waist measurement matched with that of the bodice waist. The final thing to do was to separate the bias section. I guess I could’ve just used a straight strip of fabric, too, but I think separating the piece from the skirt pattern gives a better result. The back piece has a seam in the middle, so it was fine like this. Whereas the front piece is cut on fold, so I mirrored the pattern to have the whole front piece already. You see, when cutting on bias, it’s easier to have the whole pattern piece instead of cutting on fold. Here you can see all the pattern pieces together. At this point, it’s time to test the pattern. You never know how successful your pattern is going to be. 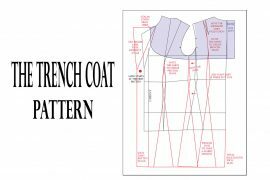 The more complicated the pattern (or expensive the final fabric! ), the more important it is to make a toile first. That way you can catch the errors and tweak the shape and fit. Sometimes you might even end up not sewing the final garment at all as you notice you don’t like the way it looks on you when you actually see it. So I went for a more complicated system including a proper camera, tripod, my phone and remote trigger app. How do the rest of you guys handle this?? Anyways, I got some pics. The bodice part was a bit too large in the front and there was some extra space at the waist, too. Compared to the original dress picture, the bias section was too narrow. I also wanted tiny bit longer sleeves, so that when I bend my arms, they’re still long. The neckline is somewhat different from the original, but I liked it anyways and left it as it was. Here’s another picture where you can see better that extra material at the upper bodice area I wanted to get rid of. 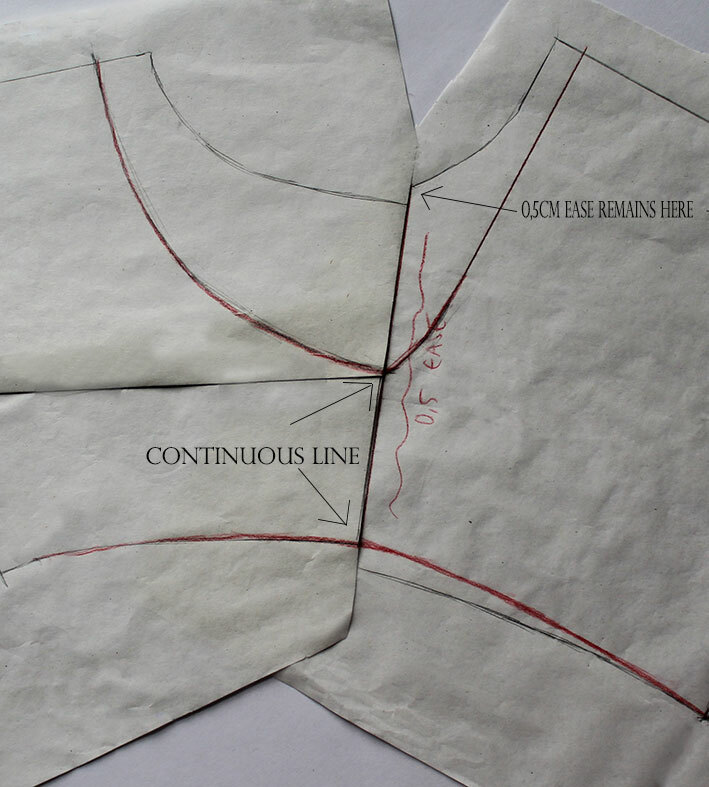 After having tried on the toile, I could make the corrections to the pattern. You can see here what I did. I decided also to add a bit of extra room to the back area and to tighten the neckline to make sure it wouldn’t be gaping. Having taken in the bodice waist, I had to do the same with the skirt. 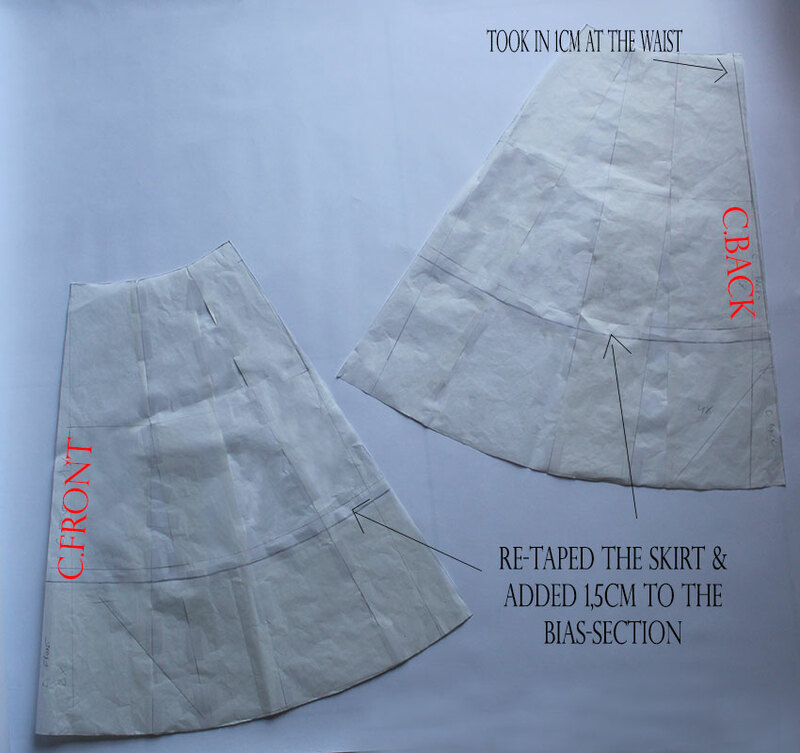 I re-taped the bias section to the skirt in order to add that 1,5cm to it. There’s no picture, but I also added 1cm to the sleeve and checked that the sleeve cap still worked with the new armscye of the bodice. And that’s it! 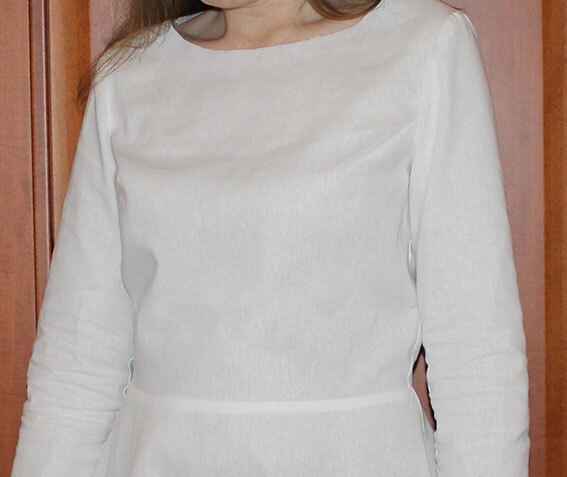 Now the final, tested dress pattern is ready to use. In the next post you will see how the dress turned out. Did you learn something new? Will you be making this dress for yourself, too? You’re welcome. 🙂 And thank You! I really appreciate it.